Norwegian endeavors to revolutionize the doubleended ferry concept have reached an important new stage with the confirmation of an opening order for the innovative FerryCat design to serve a busy route on the country's fjord-indented coastline. Developed by Fjellstrand, one of the European fountainheads of fast catamaran ferry technology, the FerryCat 120 offers a much higher speed and improved power efficiency relative to conventional doubleenders. It promises a service speed up to 22-knots compared with the 11-15 knots typical of existing, Norwegian fjord ferries, with all, which implies for productivity and fleet requirements. Service users will benefit from shorter transit times, quicker embarkation and disembarkation and a more comfortable journey. FerryCat will enable Rogaland Trafikkselskap, the first company to endorse the design, to cut the crossing time on the commuter route between Stavanger and Tau to 25 minutes from the present 45 minutes. Furthermore, the vessel will allow the operator to phase out two existing, traditional doubleenders, while maintaining a schedule based on departures every half-hour. Central to the performance attributes of the FerryCat is an all-aluminum, catamaran hull form in combination with hydrodynamically integrated propulsors. As well as providing Fjellstrand with a breakthrough deal for a vessel type, which denotes a new direction in production at its Omastrand yard, the Rogaland contract also represents the first commercial success for the Ulstein Aquamaster azipull azimuth thruster. A product of the considerable Scandinavian dimension to U.K.-owned Rolls-Royce Marine, azipull is distinguished by a pulling propeller turning ahead of the streamlined leg, giving the proven advantages of an azimuth thruster in maneuvering with the bonus of optimization for speeds in the 16-24 knot range. Due to be handed over in April 2003, the $22.4-million FerryCat 120 will have an azipull unit at each 'corner'. While a joystick system will enable the master to control all four propulsors with a single movement, the units will be completely independent, such that the vessel could remain operable with a single azipull working. Rogaland's mold-breaking ferry will convey a maximum 400-passengers and 112-cars. or a mix of vehicles having axle loads up to 15 tons. The design thereby encapsulates a comparatively large capacity and deck area within main dimensions of 262 x 66 ft. (80 x 20 m), a small displacement in relation to deadweight, and high transport efficiency. By comparison, traditional double-ended ferries are heavy displacement craft, having a large structural weight relative to carrying capacity. A central console has the navigation system, steering, controls and monitoring equipment placed in a logical layout. When the ferry's direction of travel is changed, the entire console including seats swings through 180- degrees to face the other way. The result is good visibility regardless of course and the elimination of duplicated systems. The lightweight aluminum construction not only makes for a faster vessel but also improves acceleration and deceleration properties. 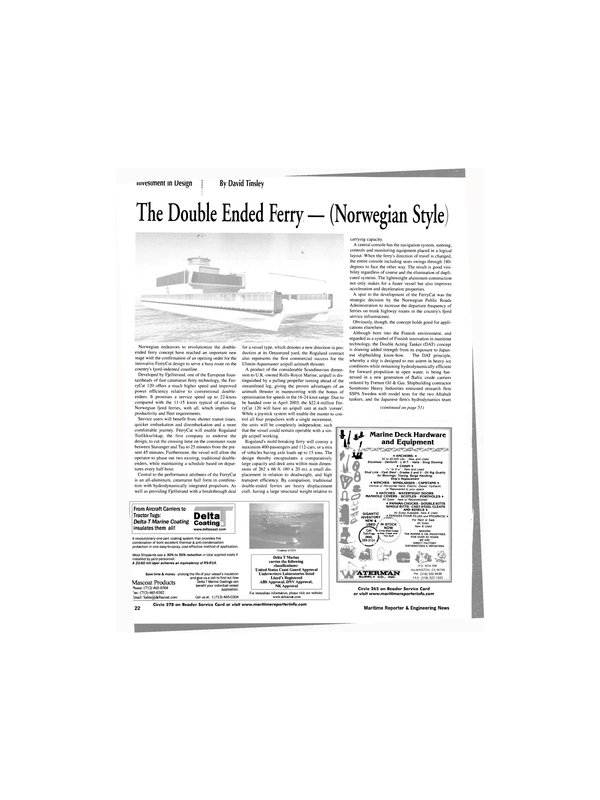 A spur to the development of the FerryCat was the strategic decision by the Norwegian Public Roads Administration to increase the departure frequency of ferries on trunk highway routes in the country's fjord service infrastructure. Obviously, though, the concept holds good for applications elsewhere. Although born into the Finnish environment, and regarded as a symbol of Finnish innovation in maritime technology, the Double Acting Tanker (DAT) concept is drawing added strength from its exposure to Japanese shipbuilding know-how. The DAT principle, whereby a ship is designed to run astern in heavy ice conditions while remaining hydrodynamically efficient for forward propulsion in open water, is being harnessed in a new generation of Baltic crude carriers ordered by Fortum Oil & Gas. Shipbuilding contractor Sumitomo Heavy Industries entrusted research firm SSPA Sweden with model tests for the two Afrabalt tankers, and the Japanese firm's hydrodynamics team developed a modified forebody in the light of indicated maneuvering performance. It is reported that shaft power at full load draft was reduced by more than six percent as a consequence of the redesign, comparing favorably with ships embodying more conventional hull lines. The 106,000-dwt vessels are primarily intended for year-round transportation of North Sea crude to Fortum's refineries at Naantali and Porvoo in the Gulf of Finland. The two ports typically experience more than 100 days of ice per year. Although the concept was initially used in retrofit applications to two 16,000-dwt Arctic tankers in 1993 and 1995, in the shape of the Uikku and Lunni, the Afrabalt sisters from Sumitomo's Yokosuka yard are the first crude carriers to embody the DAT idea from the outset. They are also the first pod-fitted, crude oil tanker newbuildings. The DAT system was originally developed by Kvaerner Masa-Yards, which has licensed Sumitomo to use the concept. Each of the Fortum ships, due for handover this coming summer, will be propelled and steered by a single, 16- MW ABB Azipod unit, assisted by twin bow thrusters, and powered by a fiveunit diesel-electric plant with a combined output of nearly 23-MW. The tankers will be able to break 0.8- m thick level ice at a speed of 3.5-knots. In open-water conditions, it is anticipated that the vessels will be able to maintain a laden service speed of 15-knots. All systems bar the mechanical part of the Azipod unit itself have been doubled, making for a high degree of redundancy. The diesel-electric power and propulsion plant will enable the Wartsila medium-speed engines to be run at optimal load, promising reduced emissions impact and long-term plant well-being. In addition, water injection is to be adopted in the diesel engines so as to curb NOx (oxides of nitrogen) formation. Concerns with safety and environmental protection are also expressed in the construction of the Afrabalt pair, whereby a 2.5-m spacing will prevail between the shell plating and the cargo tanks. By virtue of the resultantly increased ballast capacity, this has the added advantage of improving icebreaking capabilities when the vessel is sailing unladen. Moreover, arrangements have been incorporated to enable cargo to be transferred to the ballast tanks in an emergency situation. Fortum's remarkable new sisters will accordingly keep the Finnish group in the vanguard of icegoing tanker technology. The project blends Finnish design and engineering skills with Japanese prowess in efficient ship production and the Japanese predisposition for continuous improvement.